It's here at last! The stunning Kia Stinger, an elegant gran turismo based on the 2011 Kia GT Concept from the Frankfurt Motor Show, is now in full production and on sale in the UK priced from £31,995. 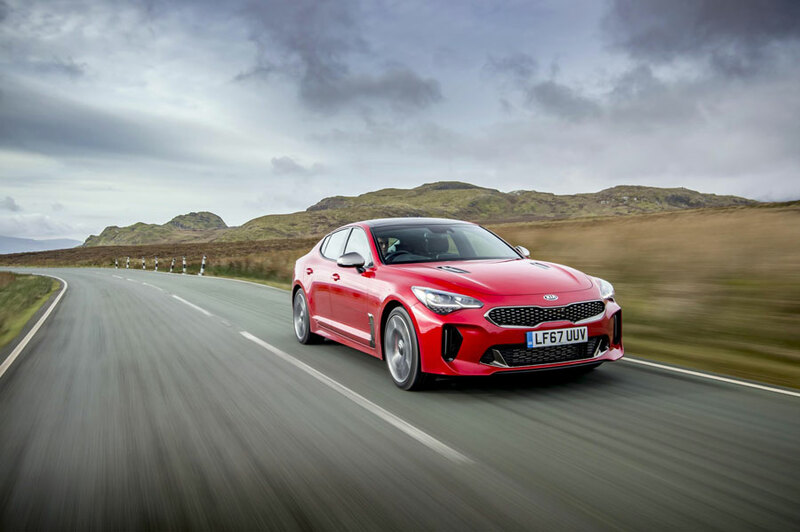 Stinger is the most adventurous model in Kia's history, the company's first classic grand tourer and the first rear-wheel-drive model it has introduced to Europe. In range-topping twin-turbo V6 guise, it is also the fastest-accelerating Kia ever, with a 0-60mph time of 4.7 seconds. Six years in the making, it was designed in Europe at the Frankfurt studios under the watch of President of Design and Chief Design Officer Peter Schreyer and European Head of Design Gregory Guillaume. Prototypes have covered the equivalent of 27 trips around the Equator, taking in extreme climate testing in Europe, Asia, the Middle East and North and South America, to perfect the car, and every development model has done at least 480 laps (10,000 kilometres) of the tortuous Nurburgring Nordschleife. The testing regime was headed by Kia's Head of Vehicle Test and High Performance Development, Albert Biermann. Stinger exhibits classic gran turismo proportions – long bonnet, short front overhang, long wheelbase, cabin positioned towards the rear of the car, lengthy rear overhang beneath broad shoulders and a 'Coke-bottle' nip in the waist. It sets a template for Kia's bold and exciting future and is the final step in the company's transition from a manufacturer of purely rational, durable, value-centric cars to one able to compete with the world's best for desirability, design and technology. This may be a new kind of Kia, but the design cues which have stood the company in good stead since Schreyer joined in 2006 are all in evidence. What Guillaume calls the "sleek and sharky" front end has a new interpretation of Kia's 'tiger-nose’ grille mounted between complex headlamp units. There is a castellated upper edge to the windscreen. And the flanks are simple and unadorned. Visual engagement also comes from the large lower grille and air intake, dark chrome highlights and bold rear diffuser with quad tailpipes on petrol models and twin tailpipes on diesels. There are 18-inch alloy wheels on GT-Line and GT-Line S versions and 19-inch wheels on GT S.
Stinger's luxurious interior is a blend of cocooning intimacy and space for five people and their luggage. Occupants slip down into their low-slung seats – leather in GT-Line and GT-Line S versions, and Nappa leather in GT S.
The seats are snug and enveloping, and the two in front have eight-way power adjustment – with a memory function on the driver's side – and a two-way power cushion extender plus four-way power lumbar adjustment. The front seats and steering wheel are heated, and in GT-Line S and GT S they are also ventilated, while the outer rear seats are also heated. On the one hand the 3.3-litre twin-turbo V6 T-GDi is the fastest-accelerating Kia ever, with a 0-60mph time of 4.7 seconds and a top speed of 168mph, while on the other the 2.2-litre CRDi's combined fuel consumption of 50.4mpg gives it a touring range of comfortably more than 600 miles. In between there is the 2.0-litre T-GDi offering much of the best of both: acceleration from 0-60mph in 5.8 seconds with combined fuel economy of 35.8mpg, allowing it to cover more than 450 miles before the driver will need to stop for fuel. 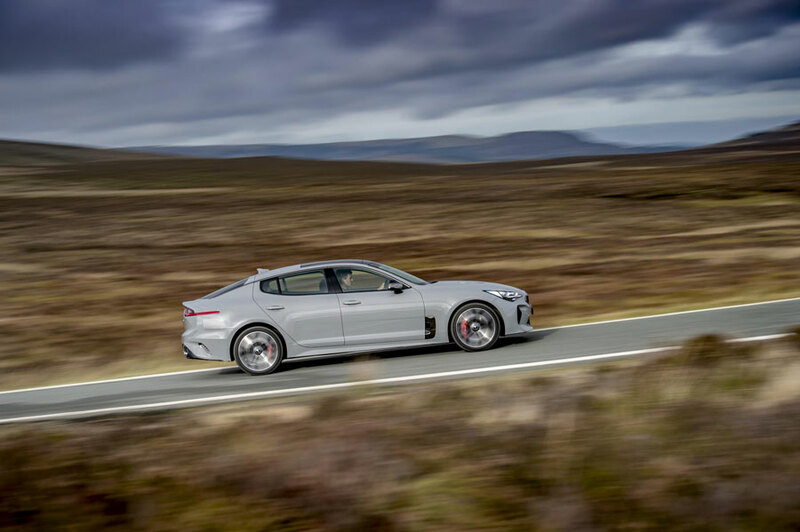 To ensure occupants can enjoy the refined sporting tones of the Stinger's turbocharged engines, the car is the first Kia to be fitted with an Active Sound System. This relays the engine note to the cabin through the car's audio system rather than the more conventional actuator. It was engineered in Europe and can be customised through the Drive Mode Selector according to which of the five programmable settings the driver has chosen. A gran turismo must provide exceptional comfort for occupants on the long distances it is designed to cover, but it must also reward enthusiastic drivers. Stinger meets those demands. Right-hand-drive cars have undergone additional testing in the UK to meet the unique challenges of the country's roads. Stinger's standard paint finish is Sunset Yellow, while Pearl White, Midnight Black, Ceramic Grey, HiChroma Red and Panthera Metal are chargeable options. Premium paint is a chargeable option at £645. Stinger comes with three interior colour options, Black leather, grey leather or red leather.